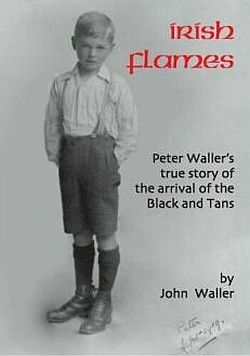 Before Peter Waller, co-founder of the American School in London, died in 1990 - he is pictured below aged eight - he gave a partial manuscript to the author, his half-brother. Here is his story. The white of peace links the Green and the Orange in the tricolour, the flag of free Ireland. 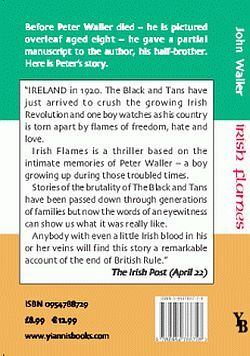 Irish Flames brings together, in tender affection, the Green and the Orange in the War of Independence. They unite against the barbaric Black and Tans, brought over by the British to "beat the hell out of the Irish". "If the persons approaching (a patrol) carry their hands in their pockets, or are in any way suspicious looking, shoot them down. Innocent persons may be shot, but that cannot be helped. I assure you no policeman will get into any trouble for shooting any man." "Very good read. Most enjoyable." "A riveting story told with pace. Compelling and visual." "It is bound to strike a chord with a great number of readers."